Truphone‘s head of R&D together with TeleStax, Metaswitch and Canonical – have demonstrated the world’s first provisioning and operation of a cloud-based IMS core and application server for a live voting service using the Truphone network. 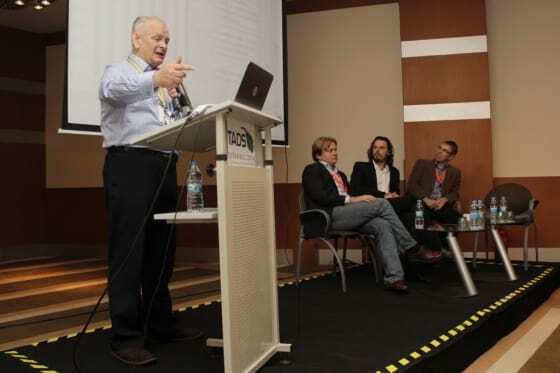 Four pioneering telecom ecosystem companies: Truphone, TeleStax, Metaswitch and Canonical created a world’s first TADSummit demo of a live, cloud-based telephone voting at the Telecom Application Developer Summit in Istanbul. The proof-of-concept demo took advantage of Ubuntu and Juju from Canonical, software from both Metaswitch and Telestax, and was connected using Truphone’s global mobile network. Built entirely on open source software, the demo was engineered in less than two weeks and conveyed how operators can reduce infrastructure costs and speed to market. “By focusing on service innovation, carriers can now rapidly deploy new services without incurring millions of dollars of integration costs and unneeded delays in launching new services,” Quayle added. Industry-wide traffic was routed for the first time from a telco into Project Clearwater, a full cloud-based IP Multimedia Subsystem from Metaswitch backed by a cluster of RestComm Telephony Application Servers. This features an API exposure layer and service-creation environment from TeleStax. Provisioned and operating within minutes were an orchestration of Ubuntu’s cloud OS and Juju Charms, thus rewriting the rules for network operators who typically spend weeks or much longer deploying new services. An IVR-polling application, which queried the Truphone HLR to play back information on the calling parties’ operators, identified which operator the demo phone was roaming on, updated a real-time dashboard with location and poll results, and sent back an SMS to the caller with a voucher at the end of the call session. This was made possible using Truphone’s core network, lookups and SMS (via API) and the provisioning of mobile numbers. This demonstration builds on the IMS in minutes demonstration presented at TADHack in June. The plans for 2015 on where this demo will go are exciting, the sponsors of TADHack and TADSummit are powerfully demonstrating the importance of an ecosystem-based approach. “Open Source communities have repeatedly proven the point that innovation does not need to wait for standards and committees. The collective power punch of Ubuntu Juju, Clearwater, and Restcomm, manifested in this demo, was made possible because of the open collaboration. We could all see each other’s work and we knew what’s possible before we even met. A few short meetings sealed the deal. Truphone saw the potential and gave it a chance. Many thanks to TADS for opening the stage to the new kids on the communications block.” – Ivelin Ivanov, co-founder and CEO, Telestax, Inc.
TADSummit is focused on building an essential yet missing component of the Telecom Industry, the telecom application developer ecosystem that creates new services and customer value. Two hundred of the best and the brightest people working on service innovation met in Instanbul over the 12-13th November. TeleStax offers carrier-grade communication products under the TelScale™ brand, based on a core set of open source projects. TeleStax’s mission is to remove complexity from the traditional telecom infrastructure and in the process create a new market for innovative communications services built by mainstream developers at a cost and time comparable to building web services. Truphone is the first mobile operator in the world to offer a truly Global service that extends beyond the borders of their home country. One of the ways Truphone achieves this is by providing multiple international numbers on a single SIM, enabling businesses to make international calls that are treated as local calls and providing contacts a direct way to get in touch on a local number. This coupled with corporate bundles that operate inclusively in 66 countries help to eliminate or reduce mobile roaming costs for voice and data services, keeping staff better connected when they travel. Headquartered out of London, Truphone has 13 offices across four continents and continues to expand aggressively.